The property is located in a quiet residential area, close to the town centre of Playa Blanca with its beaches. 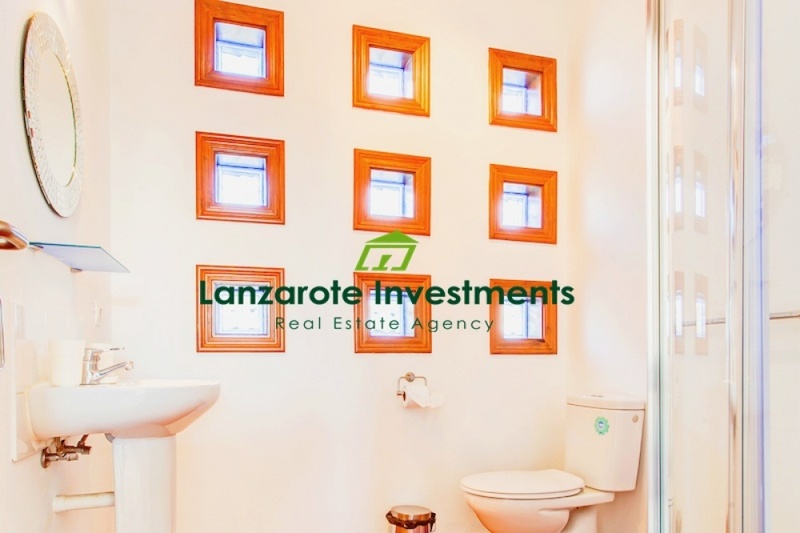 This ample villa is constructed on a large plot and originally consists of 3 double bedrooms with built in wardrobes, 3 bathrooms (one of them en suite), an extensive lounge, a modern and fully equipped kitchen with added large solana. The ample garage has been converted into third master bedroom with en-suite bathroom with a shower. The complete interior is light-ﬂooded, which makes the property feel open and airy. The private heated pool of 32 m2 is surrounded by an extensive tiled terrace with a sunlounge and a dining area with wonderful views to the red Volcano Mountain. There are also a built in BBQ and a open-air shower. Around the building is an established garden, enclosed by a high volcanic wall and at the front of the property there is a gated parking. The current owner is renting out the property at present and the rental income is substantial. Viewing is highly recommended.